This article is about the card. For the character, see Characters#Sotha Sil. 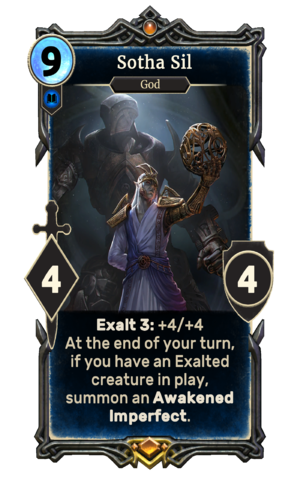 Sotha Sil is a unique legendary Intelligence creature card. It is part of the Houses of Morrowind expansion. "I am a mirror. Nothing more." "I have almost achieved perfection." "It seems I must delay my work for a time." The card's exalt ability applies the Lord Seht card effect, a reference to his title. Sotha Sil is a god of the Tribunal who first appeared in Morrowind's Tribunal expansion, and later reappeared in ESO's Clockwork City DLC. "I am the canvas upon which they paint their dreams and resentments. A vessel for their hopes and doubts. A mirror. Nothing more. You expect something grand, but I promised you the truth. "It seems I must delay my work for a time. When I reclaimed my shadow, I learned a great deal. Daedric plots. Alliances and betrayals. The return of things lost in time… the loss of things the world thought certain. I have much to do."